The first major event was the display of the John Barrow Collection curated by Books Illustrated, which included original artworks by some of Australia’s well-known illustrators including Ann James, Alison Lester, Bob Graham, Terry Denton, Jane Tanner, Julie Vivas and many more. Dromkeen continues to exhibit the work of contemporary Australian picture book creators and is currently hosting the wonderful exhibition “Stories of Life, History & Nature-told through the picture books of Mark Wilson”. Last year, Dromkeen also launched the “Mark Wilson Dromkeen Young Author Illustrator Award’, a competition open to children in Years 3-6 and Years 7-9 across Australia. 38 finalists received a signed book, a limited edition print, a writing- illustration workshop with Mark Wilson and a special lunch at Dromkeen with other members of their family. We are pleased to announce this competition will run annually. The March 30th 2019 Festival continues the theme of Australian children’s literature and will be an exciting event suitable for children, teachers, librarians, families and all children’s book enthusiasts. There will be opportunities to meet and listen to a marvellous team of authors, illustrators, cartoonists and storytellers. The launch of 2 brand new picture books!! 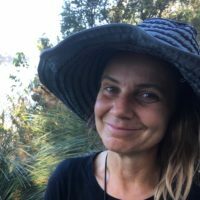 Award winning author/illustrator Trace Balla is often found sketching in nature, riding her bike with her son, dancing, and growing vegies in her garden in central Victoria. She works as an illustrator, community artist, art therapist, animator, and writer of songs and stories. She has written and illustrated beautiful books such as “Rock Hopping”, “Shine”, “The Thank-You Dish” and “Rivertime”. ‘Have a peek behind the scenes at how Trace makes her books, from sketching outdoors, to storyboards, to finished art work and a glimpse at Trace’s next Graphic Novella in progress. Then direct her in a live drawing demonstration, before creating your own mini concertina cartoon book – fantastic for early literacy, adults and everyone in between! Corinne Fenton loves writing children’s storybooks and is the author of ‘Little Dog and the Christmas Wish’, the theme for the Myer Christmas Windows in 2015. Her stories include social history and her main characters are usually animals. Corinnne’s books include The Dog on the Tuckerbox, Queenie’ and ‘Bob the Railway Dog and more recently . She has also been a judge for the Dorothea McKellar Poetry Awards. A Cat Called Trim is the title of Corinne Fenton’s latest book being released on April 1. With the recent discovery of the remains of Captain Matthew Flinders in London, the story of his loyal cat Trim is very topical. In this session Corinne will talk about the background and research of this story, the process of how the book was developed and how it teaches us something about the past. Claire Saxby writes award-winning fiction, non-fiction and poetry for children. Some of her books encompass all three. From extreme silliness in ‘There Was an Old Sailor’, to big historical stories with strong curriculum links like ‘My Name is Lizzie Flynn’, her picture books aim to engage, entertain and inform. 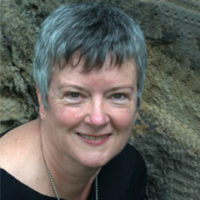 Claire’s work is published in Australia and internationally. The book is ‘The Anzac Billy’. Set in 1915, a young boy prepares a billy full of treats to send to his father at war. Illustrated by Mark Jackson and Heather Potter, pub Black Dog Books. Young children (and older) will respond to the notion of missing an absent parent and putting together a ‘parcel’ of things the parent will need/like. It sets up the opportunity for talking about what has changed, what has stayed the same, what will change and stay the same in the future. Claire will put together a billy full of the items mentioned in the story, and will be talking about what other items we might collect today, or in the future. The billy can be considered almost a time capsule. Claire Saxby writes books about our wonderful Australian animals, including Dingo. Join her to discover some of Dingo’s secrets. Which Australian animal should she write about next? Says Marc, “At the present I am working on the last chapters for an illustrated book that my friend and colleague Emily Rodda has written. She wrote the story after I sent her many images from a story I was trying to write myself but found I needed help. Emily and I have a past together. We worked on the series Deltora Quest. I produced artwork for her, often before the story was written, but usually with her collaboration and discovered back then we worked really well together and had a lot in common. We haven’t worked together in many years and it’s so good to hear her ideas again and be inspired by her words. Our book comes out later this year and I have hopes for the future of the book. I know in this world of many electronic distractions an illustrated book has a lot of competition but I believe in the story Emily has written and I’ve added as much detail as I can for the reader to look into each picture. There is a third person in the creation of these types of books and that is the reader. What each person sees between the words and the pictures adds to the story. Only in the future when people get to see our book will it be complete. At the Dromkeen open day I want to share how the pictures were created and teach and hopefully inspire other young artists. I will create an artwork and show exactly how it is done. Mark Wilson is a multiple award-winning author/illustrator with 17 books in print worldwide in nine languages. Mark has a particular passion for Australian history and the environment, particularly endangered animals, exploring these themes through his picturebooks and workshops. Mark has won 5 Royal Zoological Society (Whitley) Awards for children’s literature, 9 CBCA Children’s Book Awards, 3 Wilderness Society Picturebook Awards and was shortlisted in the 3rd C.J. Picture Book Awards International. He was also presented with the 2011 Dromkeen Medal for Services to Children’s Literature. Where those Great Ideas Come From & How to Illustrate Stories the Easy Way! ‘We are surrounded by stories – you just have to notice them!’ Students will explore this theme; from family stories to the heroes of our convict past and the amazing world we live in, our stories are so important and so inspiring! There will also be Creative drawing/illustrating Exercises – suitable for all ages and structured to stimulate students powers of imagination. They are also a lot of fun! From bugs in the yard to sea turtles – there are simple steps to creating magnificent drawings and illustrations. Students will also work through the structure of a drawing, each step at a time using line, shape and texture to experience how illustrations develop – ‘using the page to tell the whole story’. Donna has a background in early childhood education and has always had a passion to see children express themselves through art. Donna is a mother of two and enjoys creating art of all kinds. In the past, Donna has worked alongside the visual arts teacher and Artist in Residence at Donvale Primary school. 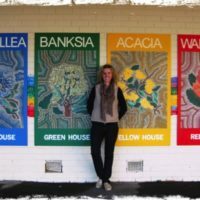 Donna has been involved with creating several major projects around the school with the students including a giant mural spanning across three buildings in the Junior School area and a magnificent ‘Four Seasons’ mosaic that is proudly displayed on the General Purpose building at the school. Donna was instrumental in making several art pieces with the students for the schools art show “Expressions 242”. Donna has also made art pieces with children in other organisations including church groups and preschools. Donna is currently running art workshops and hosting art parties at Base Camp Kids. Dromkeen Book Character Craft. Come and join Donna under the craft tent and create some fantastic craft items, all related to our beautiful Australian books. Activity 1: In the story of Eureka! by Mark Wilson. Molly and her father have emigrated to Australia to try their luck as gold prospectors in Ballarat, Victoria. A Chinese teenager, Chen, shows Molly and her Papa how to pan for gold. Come and see Donna in the gardens and pan for gold through sensory play and enjoy doing some marble painting. Activity 2: From best-selling creators Corinne Fenton and Craig Smith, this charming picture book “A Cat Called Trim” brings Trim’s story to life. This is the true story of a courageous, mischievous and fearless cat called Trim, who sailed with Matthew Flinders on his voyages to map the coastline of Australia and beyond. Come and customise your own cardboard cat called Trim by using yarn in a creative way with Donna. Activity 3: The moving story, Beth The Story of a Child Convict is illustrated with Mark Wilson’s beautifully crafted and evocative artwork, this book was inspired by the experiences of Elizabeth Hayward, the youngest female convict with the First Fleet, and the journals of naval officer William Bradley and Arthur Bowes Smyth, the surgeon and artist from the First Fleet vessel ‘Lady Penrhyn. Join Donna in the gardens of Dromkeen this litfest and craft your own first fleet vessel. 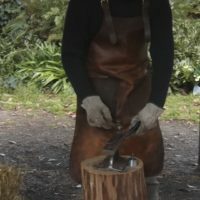 Rob Nansen (Jesses Stump Blacksmithing and Bush Furniture) is a Melbourne based artisan who works with iron and wood using traditional hand tools and techniques. Along with creating original pieces, Rob facilitates beginner workshops so others can also experience these slow and meditative crafts. Rob regularly runs blacksmithing classes at Dromkeen, so be sure to ask about enrolling in one of them. In “Blacksmithing; A Demonstration & Potted History”, Rob Nansen (Jesse’s Stump Blacksmithing & Bush Furniture) will fire up his charcoal forge and fashion a decorative S-Hook from salvaged steel while explaining the basic techniques involved. He will also provide a brief history of Blacksmithing in the Australian context. Orders of S-hooks can be made for collection on the day, and other Blacksmithed items will be on display for sale. Rob Nansen (Jesse’s Stump Blacksmithing & Bush Furniture) will demonstrate the craft of making a bush-stool using traditional hand tools, along with a brief history of this quiet yet physical art form. Look out for the display table to order Bush Furniture items. Karen has worked as an art therapist for almost 10 yrs. 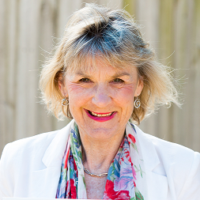 In the early years she worked in a primary school providing a safe space for children with behavioural and social needs to explore feelings and emotions. For the past 5 years she has worked from her home studio offering after school art classes for students who are artistically curious. She aspires to create a friendly, social atmosphere that encourages students imagination and offers them the freedom to express themselves through their art. She also facilitates women’s journaling groups and gets excited about conversations that open us up to think and explore self. “ Books Past, Present & Future”: Karen has some very old children’s picture books over 70 years old that belonged to her mum and books of her own and her children’s. She will present these and talk about the changes in books over the years. Participants will contribute towards an art mural called, “Books Past Present and Future.” The mural will be displayed in the Dromkeen homestead for visitors to view. Come and meet local author Ali Holborn and talk to her about her new book, “A Child’s War”. It’s a story that bridges the gap between ANZAC and today. Troy would rather kill soldiers in his computer game than write an essay for the Anzac Day competition. But when Mum comes home from Nanna Elsie’s with old photos and a journal from Gallipoli, he is transported to the horrors of a real battlefield. Whose journal is it and what is in it that makes Troy have a change of heart about writing the essay? Woven throughout the story are journal entries written by Troy’s ancestor, Arthur, who was just a child when he ran off to war. Arthur’s words take the reader into the harsh reality of trench warfare at Gallipoli and contrast with Troy’s comfortable and indulged life in the current day. Dear Daisy Chain by S.A. Nansen will be selling original framed screen printed illustrations, limited edition Artist Books, gift cards and postcards. 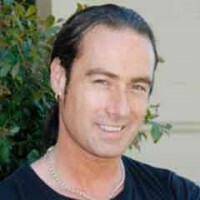 Dromkeen mainly stocks the work of Australian children’s book creators. Come and select a book from our quality range of children’s picture books. Have yours personally signed by our guest speakers or buy a limited edition print or original artwork from our selected range. Any updates will be posted here closer to the date. There will be stocks of books for sale by all the authors and illustrators presenting on the day of the festival. At the end of sessions, authors and illustrators will be available to sign their books. Collins Booksellers from Sunbury will kindly be assisting Dromkeen with sales on the day.